Formerly known as the Café at Buena Vista, the remodeled Blue Heron Café is enlarged from the hospital’s previous dining space. Its new name and theme pay homage to the county’s maritime history and wetland residents. 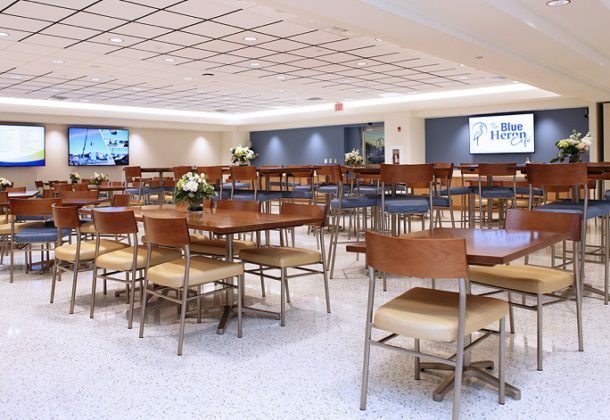 New features of the café include state-of-the-art audio/visual equipment, premium tables and seating, and the ability to separate the space into two meeting rooms, as needed. The project was almost entirely funded by donations from associates, the medical staff, the hospital auxiliary, the hospital foundation, MedStar Health, and the Leonardtown Rotary Club, as well as members of the community. A custom art wall inside the café acknowledges these contributions. Those who donated to the project were invited to tour the new café at a special reception held March 19 before its official opening the next morning.